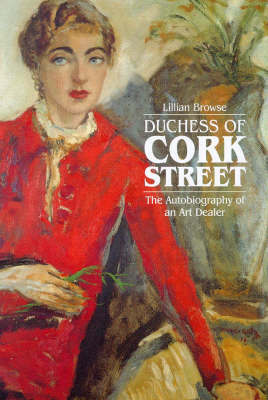 Duchess of Cork Street is the autobiography of a remarkable woman who, educated in the culturally unsophisticated milieu of South Africa, managed by charm, determination and good judgment to establish herself as a doyenne of the London art world between about 1950 and the late 1970s. Although Lillian Browse had originally had ambitions to become a ballet-dancer, she joined the staff of the well known Leger Gallery in the early 1930s, and in 1945 she set up a new art gallery called Roland, Browse and Delbanco in Cork Street in the west end of London together with two fellow art dealers, thus coming to know through her varied experiences many of the most distinguished people of her time as clients and friends. She had worked with Sir Kenneth Clark on planning exhibitions in the National Gallery during the war. Her gallery soon acquired a reputation for quality and integrity and, with her distinctive and influential taste, she pioneered the study of important French and English painters and sculptors, among them Degas, Rodin, Sickert, William Nicholson and Augustus John, and she also gave consistent support to an expanding group of living artists. She was active in the world of art-dealing for over fifty years. During that period the character of the profession changed out of all recognition. Although the spotlight has now moved from London to New York for a variety of reasons, she is by no means despairing of the future. The number of galleries is growing fast, especially away from central London. Above all, there is a much wider interest in art and appreciation of living artists in Britain than ever before. She played a significant role in helping to bring that about. Lillian Browse, who was awarded the CBE in 1998, remains a popular and revered personality in the art world. Her book has been eagerly awaited. Lillian Browse was brought up in South Africa, and she returned to England in the mid 1920s to study ballet with Margaret Craske, joining the Dolin-Nemtchimova Ballet Company in 1930. She became ballet critic to the Spectator for four years in the early 1950s. She worked at the Leger Gallery from 1931 to 1939; then, during the war, she organized exhibitions at the National Gallery and for CEMA, the precursor of the Arts Council. She was a founder partner of the art gallery Roland, Browse and Delbanco in 1945, and also of Browse and Darby in 1977. It was Lillian Browse's neighbour Rex Nan Kivell, the founder of the Redfern Galley and a close friend, who christened her 'duchess of Cork Street'. She organized the Sickert centenary exhibition at the Tate in 1960, later exhibiting her own private collection at the Courtauld Instititute Galleries in 1983. Among her many books have been volumes on Augustus John's drawings, Sickert, Degas' dancers, William Nicholson (catalogue raisonne) and Forain's paintings.